Valiant Hearts is a wonderful story trapped inside a video game. An epic tale set against a (mostly) realistic take on the First World War, Valiant Hearts tells the story of a number of very nice people caught up in the events of one of humanity's most pointless and bloody struggles. The way it fleshes out memorable characters using nothing but grunts and body language (the spoken word is kept to a minimum), Valiant Hearts is somehow able to take a war that was almost unbelievable in its abstract cruelty and turn it into a very human story that deals in all the feelings, not just the tragedy we all saw coming a mile off in its early trailers. The wartime France (and Belgium) the game depicts is just...it's beautiful. It's a beautiful place, even with a war going on. Ubisoft's 2D tech just gets prettier with each game. Any level with a green field feels like a fairy tale, or a Ghibli movie, while there are sections at night that might, through their use of colour and sound, be the most "realistic" I've ever experienced in a game. I was nearly in tears within the first 30 seconds. I was in tears by the closing credits. 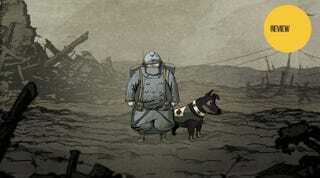 That's partly down to the way the story ends (it's a First World War game, there has to be tragedy somewhere), but also because of Valiant Hearts' score, which throughout the game is able to take a cartoonish landscape starring deformed characters and make it a world that's constantly evocative. If this was a comic, I would buy every issue then buy the trade paperback again at the end. If this was a cartoon, I would watch every episode. If this was a movie, I'd drag all my friends along to see it, even the ones who know I'm super annoying and pedantic about history, just to say SEE, SEE, even the boring old First World War can be both interesting and deeply touching when you see it through human eyes. 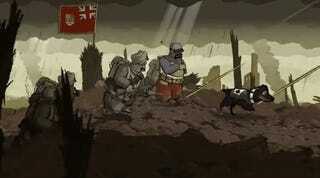 But Valiant Hearts is none of those things. It's a video game. And the game parts aren't that great. You'd expect a First World War game to be, well, an action title. Something involving shooting, and cover, and running, and bullets, and reloading, and health kits. And while Valiant Hearts does include some of those things, sometimes, the rest of the gameplay it finds itself saddled with splits its time between erratic action sequences and pedestrian puzzle sections. There are cars. Some sections see you driving a vehicle, only you're not really driving, you're rolling down a road and can only move left or right dodge obstacles. It's about as taxing (and enjoyable) as a 1980s LCD portable, even with the novelty of enemy attacks coming in time to frantic classical music. There are medics (well, a medic). Her gameplay is probably Valiant Hearts' lowest ebb, as all you really do is run around whipping out magic bandages every few minutes to save the life of some poor sod by nailing increasingly-difficult rhythm sections. Imagine Guitar Hero, only it's being literally played on a bandage. There are puzzles. These sections can be better. Sometimes. When you're being asked to do something new (a uniform exchange near the end is a highlight), or make use of your dog sidekick, they can be the right kind of taxing. Most of the time, though, you're simply repeating the same basic puzzle templates over and over. Some rudimentary pressing of buttons or pauses for puzzles would be OK if they weren't too great an interruption on the flow of the story you're swept up in, but often they're little more than frustrating roadblocks, and sometimes the contrast between what's going on in the story (or the background) and what you're being asked to do is absurd. There's a section near the end where, with some loved ones under attack, everyone's life is in grave and imminent danger. You're thrust into such a scenario to...complete a puzzle, where you fumble around blindly and slowly, a child screaming in the distance, seemingly on the brink of death but really, he'll just keep screaming until you sort out that puzzle. Take all the time in the world, he will scream as long as it takes for you to sort it out. While I understand the need to find something more casual and laid-back in terms of game design that would allow for a more considered exploration of the war, the way Valiant Hearts implements its interactive elements comes very close to spoiling the whole damn thing. The game does such a good job of setting up a constant supply of dramatic and moving scenes, full of death and glory and sacrifice and loss, only to undermine them at every second step by either killing the pacing or making a farce of the scenario you find yourself in. This isn't helped by the occasional tonal misstep. For so much of the game, everything is played straight and historically accurate, to the point that you can constantly dig through text pop-ups to learn more about the war. There's accurate tech, faithfully-recreated living conditions, attention paid to the nuances of ethnicity and nationality along the Franco-German border and even sections highlighting the under-appreciated role Indian and African troops played in the British and French armies. And then...they go and jerk you back from all that by turning the story - which could have done with trimming to avoid an overly-long pursuit of a German bad guy - into a cross between Forrest Gump and Star Wars, where the same four people somehow end up running into each other at every major battle of the war. This jarring isn't helped by Ubisoft making the villain a ridiculous caricature of the "Bad German", one who drives around in fantastical weapons of war that would be more at home in League of Extraordinary Gentleman than the trenches of 1916. It just makes you go ungh, why, why go to so much trouble to make this feel somehow deeply authentic to only go and drop you in a boss fight against a giant German science tank, or a Zeppelin that looks like it should have been blown up in a Bond movie? But then, maybe I just care about that rubbish because I'm a history dork. You might be a saner person than I who can appreciate that sometimes a good yarn (or a change in gameplay) is more important than faithfully recreating the most indiscriminate meat grinder in human history. Which, let's face it, doesn't sound very fun, and is the top reason nobody else is making First World War games (or really, ever has). In most games, the story is an interruption to the gameplay. In Valiant Hearts, the opposite is the case. The game's slowest points, whether a cutscene or the many times you're simply walking a character around soaking up the sights of wartime France, are its strongest. I wish there could have been more of them, as I had more fun seeing wartime police play cards and soldiers on their downtime playing in a band than I did running through a trench blowing up Germans. If I sound really down on the entire thing, I'm not! I'm just frustrated that some design missteps put a dent in an otherwise fantastic game. Like I said up top, there are so many aspects of Valiant Hearts that are endearing and instantly memorable. This is a unique experience, from its setting to its presentation to its design (even if the latter doesn't always work), one that anyone interested in history, adventure games, animation and/or video game story-telling needs to check out.